Humanities Bulletin is a multidisciplinary peer-reviewed Journal which features original studies and reviews in the various branches of Humanities, including History, Literature, Philosophy. Whatever. A Transdisciplinary Journal of Queer Theories and Studies exists to facilitate a dialogue among researchers who work in any field related to queer studies. Its purpose is to offer scholars working in queer studies, in and out of academia, a place to share their work, to reach like-minded readers, to initiate collaborations, to make things happen. We aim to foster a diverse and mutually respectful community among scholars of different backgrounds, research interests, methodological allegiances and disciplinary affiliations. Each issue of Whatever will include a general section, which will host papers dealing with any and all aspects of queer theories and studies, and several themed sections, each curated by an independent editorial team. A list of the themed sections for the second issue, including deadlines and submission guidelines, can be found at https://whatever.cirque.unipi.it/index.php/journal/announcement/view/1. The summer school will be organised for doctoral and postdoctoral researchers and will be held at Landau (Germany) from August 20th to 24th 2018 focusing on the topic: “Political Masculinities in Europe: New Definitions, Methods and Approaches”. The Summer School will feature four key-note speakers and is organised by Kathleen Starck (University of Koblenz Landau) and Birgit Sauer (University of Vienna). The editors of EJES are issuing calls for papers for the three issues of the journal to be published in 2020. Potential contributors are invited to submit detailed proposals of up to 1,000 words to the guest editors of the topic they are interested in. The deadline for proposals for this volume is 31 October 2018. EJES operates a two-stage review process. Contributors are invited to submit proposals for essays on the topic in question by 31 October 2018. Following review of the proposals by the editorial board panel, informed by external specialists as appropriate, the guest editors will invite the authors of short-listed proposals to submit full-length essays for review with a spring 2019 deadline. The full-length essays undergo another round of review, and a final selection as well as suggestions for revisions are made. Selected essays are then revised and resubmitted to the guest editors in late 2019 for publication in 2020. The Open Access journal Colloquium – New Philologies, the Alpen-Adria-Universität Klagenfurt and the Alps-Adriatic-Rectors’ Conference are happy to announce the 3rd AARC PhD Students’ Conference entitled: Language.Literature.Politics. 1918-2018. (Un)doing Nationalism and Resistance, to take place from Thursday, 20th to Saturday, 22nd September 2018 in Klagenfurt (Austria), at the Alpen-Adria-Universität Klagenfurt. Although it may seem to many as a case of déjà vu, we actually bear witness to a cyclical turn of events in history. The world shortly after World War I seems very similar in many ways to the current state of affairs in the sense that another major push against multinationalism, multiculturalism, and globalism is clearly evident. Mirroring 1918 and the nationalist movements of the time, 2018 seems to bring a strong (or at least a loud) return to nationalism. After a long general movement into globalization, unification, and multiculturalism that has marked the period succeeding World War II, nationalism, particularly in the Western World, seems more pronounced today than any time in the last 70 years. It is particularly rampant in the political discourse of today. On the other hand, supranational entities such as the EU, seem to be deriving new motivation precisely from the revival of these nationalistic tendencies. A thorough look is hence needed into the languages not only of nationalisms, but also of critique and resistance to them, especially into their narrative, rhetoric, and argumentative strategies, as well as their use of metaphors, images, and other devices of communication. We look forward to welcoming you to an inspiring scientific exchange in a very peculiar region. The Alps-Adriatic region is gifted and haunted alike by its very special historical and sociocultural situation as the point of intersection between three language communities, various systems of beliefs and thoughts as well as economic and political experiences. It is a region characterised by experiences of generations of the local population that were able navigate between these various linguistic, cultural, and political systems as part of their everyday lives, within and beyond existing national boundaries. Contributions may take the form of traditional paper presentations (20 minutes plus 10 minutes question time) or of standard poster presentations. Additionally, we are also featuring theory reading and discussion workshops (discussion groups organized around a previously set reader, particularly open to early career researchers). Extended abstracts of approximately 800 words (including a theoretical outline, the methodology employed, and the tentative results) are to be submitted as MS Word (.doc or .docx) file to aarc18@aau.at by 15th April 2018, while the notifications of acceptance will be sent out by 1st June 2018. There will be a limited number of travel and accommodation grants available. Further information will appear on the conference website. Selected contributions will be invited for publication in a special issue of the Open Access Journal Colloquium – New Philologies (http://colloquium.aau.at/). Plenary speakers to be announced. 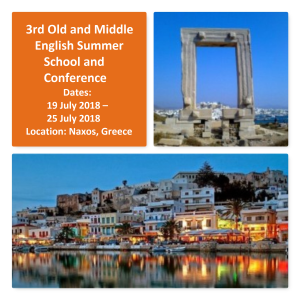 We are happy to inform you that registration is now open for the 3rd summer school program and conference on the history of English to be held on 19-25 July 2018 on the island of Naxos, Greece, under the aegis of the Alexander S. Onassis Public Benefit Foundation. The summer school will offer Old and Middle English intensive language and linguistics classes for a period of seven days. The aim is to attract students and scholars to study topics in Old and Middle English in a relaxed yet very focused and stimulating atmosphere that promotes in-depth analysis and discussion. Certificate of attendance will be awarded to all participants plus certification of the 6 ECTS gained, issued by the University of Osnabrück. 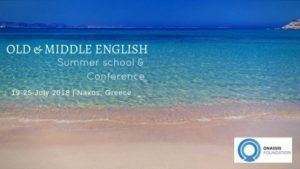 The 3rd Old and Middle English Summer School in Naxos will also be organizing a conference on “New Approaches to the History of Early English(es) III” as well as thematic and poster sessions on: language change, historical morphology and syntax, historical phonology, historical sociolinguistics, linguistic theory and historical data, language teaching and dialectology (diatopic aspects), language teaching and diachrony (diachronic aspects). The 2018 Old and Middle English Conference will be held under the aegis of the Alexander S. Onassis Public Benefit Foundation. Registration fee: 35 euros, it covers the light lunches for the whole period of the summer school and the conference. Accommodation: We can offer 29 beds at the municipality hostel (Vivlos/Tripodes village) for the whole period of the summer school and the conference (July 18-26). Financial Aid: 4 scholarships available (of 250 euros each) for students of Greek universities. Applications accepted until April 15, 2018. Financial Aid Instructions: In order to apply for a scholarship, please upload your motivation and your CV to the online application form before the 15th of April, 2018. Places are limited, we therefore advise you to enroll as quickly as possible. ELOPE: English Language Overseas Perspectives and Enquiries (http://revije.ff.uni-lj.si/elope) is a double-blind, peer-reviewed academic journal that publishes original research of English language, literature, teaching and translation. The spring 2018 issue of ELOPE is dedicated to the position and role of speculative fiction and especially science fiction in a world that is increasingly becoming speculative and science fictional. The globalized, digitally mediated nature of contemporary realities and, indeed, individuals, increasingly corresponds to those imagined by the literary cyberpunk of the 1980s – by the movement which with its formal and thematic properties arguably blurred the dividing line between the “mainstream” literary fiction and the science fiction genre. In the first decade of the third millennium, the extrapolations of current technologies and science typically associated with the genre seem to be moving from the temporal to the spatial axis, that is, from the futures far far away to the multiplicity of presents and realities that are parallel to ours. Jaak Tomberg attributes this collapse of futurity to the “cognitively dissonant pace of change in contemporary technocultural society” which renders imagining of ontologically different futures impossible. Approaching the issue from the perspective of postmodern theory, we can similarly ascertain that in a world in which the digital code precedes reality, the present is a priory infused with futurity, and any (literary) speculation cannot NOT be realistic. On the other hand, recent developments in the field increasingly reveal an alternative, radically different approach to futurity. In the 2014 collection of essays on contemporary science fiction SF Now, for instance, contributors acknowledge the prevalence of texts in which the future is a furtherance of the technocultural, late capitalist present; however, with regard to the social, cultural and historical relevance of the genre in the coming years, their focus is directed at the narratives in which the future transcends imaginable possibilities and inspects the potentialities of a different ontological order. What, then, is science fiction today? What is its role? Has the collapse of futurity onto the present caused an irretrievable convergence of the speculative and the mimetic? How does that reflect on the language used? The stylistic properties? On the ways such fiction is translated? How much sense does it make to treat science fiction – or anything else for that matter – as a genre significantly different from other instances of writing in the context of the postmodern paradigm which fundamentally revels in hybridity? To what an extent do traditional definitions of the genre still apply? What can be considered cognitively dissonant and what can be considered a novum in a world that seems to have no outside? Can there be an outside, and if so what is it (would it be) like? 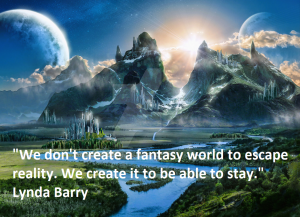 What role can science fiction play in our imaginings of the future? And of our present? What does it have to offer? What can it teach us? These are some of the issues we would like to address in the up-coming issue of ELOPE. The editors warmly invite contributors to submit original research on these and related topics, and to provide insights from as wide a range of perspectives, approaches and disciplines as possible – not only from the seemingly primary domain of literary studies, but also from the perspective of language and translation studies, as well as ELT. The language of contributions is English. Papers should be between 5,000 and 8,000 words in length, with an abstract of 150–180 words. They should be submitted electronically, and should conform to the author guidelines (http://revije.ff.uni-lj.si/elope/about/submissions). Any inquiries can be sent to Andrej Stopar (andrej.stopar@ff.uni-lj.si). Submission deadline: April 1st, 2018. The Nordic Journal of English Studies (NJES) is an international journal publishing articles in the field of English literature and linguistics. Although an important aim of the journal is to promote the field of English studies in the Nordic countries, it publishes articles from international scholars both within and outside Europe. All scholars working within the field of English literature and linguistics are thus welcome to make submissions. New PhDs and PhD candidates are particularly encouraged to submit their work. NJES also publishes special issues focused on a particular theme in English language and literature. The journal is peer-reviewed and listed in the MLA, EBSCO and ERIH databases. To submit your article or for more information please contact us by email at nordic.journal@sprak.gu.se . Deadline for submissions: 1 March 2018. 2017 marks the 200th anniversary of Jane Austen’s death. What she left as her bequest to the world was to become a prolific space where sense, persuasion, sensibility and pride remained pre-eminent and where the Elinors, Mariannes, Janes, Elizabeths, Emmas, Darcys, Brandons, Willoughbys and Dashwoods still congregated together or at least briefly crossed each other’s paths. More than 200 years after their first publication, her novels are still avidly read as books and even transformed into successful film adaptations. In the 21st century her creations still provide a source of fascination and continue both to captivate well-seasoned readers and to animate fresh audiences. The questions that naturally arise are, then: Why are people still so obsessed with Jane Austen? Why is her legacy still alive and spreading? Is it because she has a sincere, direct, natural and convincing way of depicting human nature? Is it because her works are easily translated or adapted across various mediums, cultures and time periods? What is it that constitutes Jane Austen’s face in the 21st century? Questions such as these may help to suggest some of the topics for the Winter 2017 issue of the ESSE Messenger. Proposals should be submitted to the Editor by 1 October 2017. Stop news: A new picture has been added to the GSN Gallery. Coils of the Serpent is a scholarly journal dedicated to the investigation of contemporary manifestations of power, launched in 2016. It is intended as an open-access platform on which diverse theories and analyses of power shall be developed, brought into dialogue with each other, discussed, criticized, illustrated and popularized. The orientation of the journal is interdisciplinary; it is conceived as a forum for a lively exchange of ideas and opinions between the fields of sociology, political science, philosophy, history, economics, literary, cultural and media studies, psychology, educational sciences, and others. The phenomenon of power is essentially tackled on three levels, which can be interwoven to varying degrees: on the level of theory, on the level of case studies (of concrete institutions, social practices, discourse formations, dispositifs, forms of subjectivation, spaces, etc.) and on the level of contributions dealing with cultural and artistic engagements with power. Contributions addressing the issue on one or more of these levels are welcome from all the relevant disciplines. 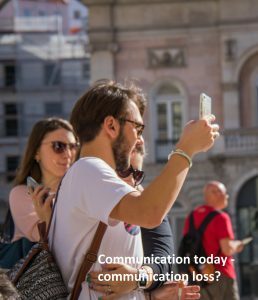 Besides the traditional essay, the journal also publishes more unconventional texts as well as shorter statements, discussions and commentaries. It publishes only original work and only manuscripts written in English. We also explicitly invite submissions that are not fully ‘rounded’ and ‘finished’ scientific pieces, but rather of a fragmentary, ‘work/thought-in-progress’ nature. Since Coils of the Serpent aims at reaching a wider readership than exists for academic writing, the texts submitted should aim at a certain degree of accessibility. All submissions will be peer-reviewed. We also invite proposals for thematic special issues. The International Journal of James Bond Studies is an academic peer-reviewed journal dedicated to publishing interdisciplinary scholarship on all aspects of Ian Fleming’s James Bond franchise. The journal aims to develop contemporary critical readings of Ian Fleming’s James Bond across literary, filmic, and cultural history, and offers broader criticism of the popular appeal of Fleming’s creation and its relation to the spy genre. The journal will appeal to scholars, academics, and cultural critics whose work focuses on Ian Fleming and James Bond, as well as to fans of the James Bond franchise who wish to supplement their knowledge in this area. other academic works on James Bond. Articles of 6,000-8,000 words and reviews of 2,000 words will be considered. ELOPE: English Language Overseas Perspectives and Enquiries (http://revije.ff.uni-lj.si/elope) is a double-blind, peer-reviewed academic journal that publishes original research articles, studies and essays that address issues of English language, literature, teaching and translation. The editors, Smiljana Komar and Mojca Krevel, warmly invite contributors to submit original research related to these fields for the next issue of the journal (Vol. 14, No. 2, 2017). The language of contributions is English. Papers should be between 5,000 and 8,000 worlds in length, with an abstract of 150–180 words. They should be submitted electronically, and should conform to the author guidelines available at http://revije.ff.uni-lj.si/elope/about/submissions. Any inquiries can be sent to Andrej Stopar (andrej.stopar@ff.uni-lj.si). Submission deadline: September 1st, 2017. The editors of EJES are issuing calls for papers for the three issues of the journal to be published in 2019. Potential contributors are reminded that EJES operates a two-stage review process. The first is based on the submission of detailed proposals (up to 1,000 words) and results in invitations to submit full essays from which a final selection is then made. The deadline for proposals for this volume is 31 October 2017, with delivery of completed essays by 31 March 2018.